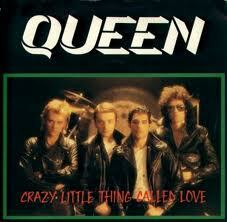 "Crazy Little Thing Called Love" is a song by the English rock band Queen, written byFreddie Mercury in 1979. While it peaked at number two in the UK, it hit number one on theU.S. charts on 23 February 1980, remaining there for four consecutive weeks. It topped the charts in Australia for seven weeks. In Brazil, the song was included in the international soundtrack of Tempos Modernos. Last year (2010) of August Somsak Tejcharattanaprasert and Panya Nirankol of Thailand released the movie entitled สิ่งเล็กเล็ก ที่เรียกว่า..รัก, Crazy Things called Love (Romance and comedy) starring Mario Maurer as Chon and Pimchanok Lerwisetpibol as Nam. And this year ABS-CBN aired this movie last Sunday before ASAP rocks,and suddenly I noticed that I enjoyed watching it because it is very a high school thing I remember my high school days.I even watched again the movie at You Tube.And I really love it, the story , Shone and of course Nam. 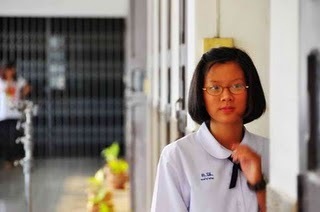 The story is about a girl named Nam, she is a young and ordinary high school girl, unattractive with nerd glasses and dark skin tone. She has a big crush on a heartthrob senior (Chone) at school. To make him see that she exists in his world, the girl tries to improve her physical look and attempts to become the star at school. However, her crush seems not to pay any attention to her yet. I love this Confession scene, I love the way Nam cried while saying that she is ok even she heard that Shone had a girlfriend already after she told that she liked Shone very much. This is the ending part after 9 years when they met at the TV show wherein Nam is known being the top designer and Shone as professional photographer..They look lovely together. I think I'm already one of the Mario-Fern fanatics..